Simone O'Callaghan was born and grew up in Australia but has been UK based since 1999. She is an interdisciplinary artist, combining new technologies with analogue artforms, who has exhibited in the UK, Australia, China and Canada. She is working on an art-practice based phd at Duncan of Jordanstone College of Art & Design (DJCAD), University of Dundee, Scotland, examining graphical tagging in artworks to explore the relationships between materiality, physicality and craft in contemporary digital and print-based art practices. 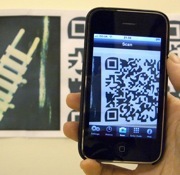 Simone_s work in the studio focuses on ways to embed QR-codes and other graphical tags into print-based artworks in such a way that makes the technology transparent to the user and less intimidating to engage with. At the end of 2008, Simone took part in a UK Digital Economy Sandpit (EPSRC/ AHRC) and was one of the core team members responsible for securing ú1.39M funding for the TOTeM Research Project which explores attaching stories and memories to objects using tagging technologies such as QR-codes. In other lives she has been a Senior Lecturer in Creative Digital Design, Senior Designer, & Art Director. Simone hopes to eventually move back home to Australia. This paper explores a collaboration between TOTeM (Tales of Things and Electronic Memories), a UK University research project based around the 'Internet of Things', and Dundee Contemporary Arts (DCA) Print Studio. Supported by the Digital Economy Research Councils UK, TOTeM explores new ways of preserving people's memories and stories, through linking objects to the Internet via emerging technologies such as QR Codes. In this collaboration, print-based artworks produced at Dundee Contemporary Arts for the DCA Editions programme, and artworks made also by invited members of the open access print studio are linked (known as 'tagging) via a QR code to digital media content which can be played on a mobile phone. The TOTeM team at the University of Dundee are carrying out research through the use of a public facing site, developed by their UCL partners called talesofthings.com where digital media content relating to artworks created in the DCA Print Studio is uploaded. This may take the form of video, text or audio of stories and inspiration, in the creation of the artworks. By working in collaboration with a community of artists, tagging can provide a platform of communication about the artwork between the artist and potential buyer/ collector. Although, this is a means of enabling artists to connect with their audiences, reaching beyond artist/ maker communities and out to buyers and collectors, other research questions arise, such as, Do artists really want the concepts behind their works to be explicit? What does this mean for the artist and their audiences if the 'mystery' surrounding concepts, or how the work was produced, is demystified in this way? If artists choose to create digital content relating to how the work was produced, how does this affect their working practices in the print studio? This paper examines initial findings in terms of the research questions, art making and the logistics encountered when marrying print-based artworks with cutting-edge mobile technologies in the context of a large multidisciplinary research project. Drawing from research currently in progress for an art practice-based phd1, this paper examines artists' processes in the context of materiality, tactility and crafting works of art which incorporate printmaking and the use of mobile devices. The phd research questions notions relating to materiality and the art object which arose in the 1960's with conceptual art, and which again came into play in the 1990's with digital media. Critical thinkers Lucy Lippard, Martha Buskirk and Lev Manovich provide a conceptual backdrop for art practice and research into de- and re- materiality in a print studio environment. Working at the point where printmaking and digital media intersect, this research is a study of relationships between the physical, material and digital through making works where 'graphical tagging' is used as a bridge between the physical world and that of digital mobile media. A 'graphical tag' is a two dimensional barcode which can be scanned by a mobile phone-camera to link directly to web-based content. This can take any form, from text to audio, images and video. There are many different types of graphical tags, so as yet no universal standards, but currently the most common in use in Britain (where this research is based) is the QR-code. Discussion of studio practice in the context of medium and materiality is key in this paper, and in particular, how logistical problems working in the studio open up paths for critical thinking and writing, which would never have occurred had the studio practice not taken place. For example, current studio work focuses on using processes such as photoetching to break away from the mechanical feel of a computer readable code, and to reconcile the aesthetics of the code within the content of an image. Here the very act of inking up an etching plate leads to textures and qualities unique to that medium, so the limitations of an emerging technology are being challenged by traditional printmaking processes, leading to conceptual exploration of what this can imply. When creating works such as these, where there is a physical material component (the print) and a digital component (a mobile optimised website) studio practice also gives rise to questions for the maker such as, Which comes first - the digital media or the physical print? One needs to 'point' the code somewhere to link to the digital media, but in making the works, sometimes the digital content is actually influenced by the printed artwork or vice- versa. The material properties of print such as paper choice, tonal range, texture and colour, become even more important when viewed in contrast to a digital component which is limited by the nature of a mobile phone screen.